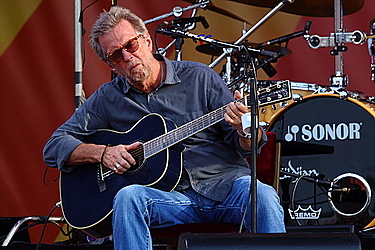 Eric Clapton is recalling Prince as a true genius and the inspiration for Clapton's song "Holy Mother." In a Facebook post Saturday, the rock and blues musician told of a dark time in his life in the 1980s that was eased by discovering Prince through the 1984 movie "Purple Rain." "I was out on the road in a massive downward spiral with drink and drugs, I saw Purple Rain in a cinema in Canada, I had no idea who he was, it was like a bolt of lightning!" Clapton wrote. "In the middle of my depression, and the dreadful state of the music culture at that time it gave me hope, he was like a light in the darkness." Returning to his hotel room and "surrounded by empty beer cans," he recounted, Clapton wrote the song filled with both pain and faith. "Holy Mother, where are you? Tonight I feel broken in two. I've seen the stars fall from the sky. Holy mother, can't keep from crying," the song begins. It ends with, "When my hands no longer play, my voice is still, I fade away. Holy mother, then I'll be lying in, safe within your arms." On Facebook, Clapton wrote that he was "so sad about the death of Prince," adding, "I can't believe he's gone." Prince, 57, was found dead Thursday in his suburban Minneapolis home, with the cause of death unknown.